Tow Now App - The Tow Truck Magnet! Roadside Rescue - Free app No Subscription ever. Download the app now and a Rescue Truck will be with you in minutes! Get Breakdown Rescue now with Tow Now App! If your car has let you down on the side of the road or if you need a Tow to get your car to a local garage for repairs or even if your car needs to be nct’d it’s no problem for TowNow our drivers will accommodate any situation. · Simple and fast navigation. · Profile which is safely stored. · Promo codes to enjoy discounts. · Set your desired tip amount %. · Detailed history of each Trip. · Discount voucher to send friends. · App info and contact details. We'll get everything set up and get you registered in no time! 1.3 Please note that we are not responsible for the behaviour, actions or inactions of drivers of TowNow vehicles which you may use (through TowNow or otherwise). Any contract for the provision of tow trucks licensed vehicle services is between you and the driver and not TowNow and we simply provide a platform to introduce drivers and passengers. 2.1 It is free to generally use the TowNow app and website and you will not be charged a commission for using the service. 2.2 If you choose to pay for a tow truck through TowNow then such payment will be taken automatically at the end of the journey using the card details you registered with us and which we will store for such purpose. You agree that we may undertake authorisation checks on that card when you first join as well as when you take a TowNow truck journey. Payment(s) will be processed via a third party payment processor under TowNow App. 2.3 When you join TowNow, you will be given the option to pre-set a default “tip” percentage of your choosing. This will automatically be added to the fee at the end of each journey unless you choose to override it with a different tip amount or to remove the tip. You can re-set the tip default amount at any time by updating your profile details via the app. 2.4 Once you have taken a truck with TowNow you won’t be able to cancel (since the service has already been provided) and your payment will be taken automatically and is non-refundable. If you have any complaint in relation to the towing service provided then that dispute must be taken up with the truck driver directly. If you are unable to resolve the dispute with the truck driver or you cannot come to an agreement with the truck driver, please contact TowNow and we will try to resolve the dispute. Cancellation. We reserve the right to charge a cancellation fee if you cancel an order after a Truck has been allocated to your job. View our Cancellation Policy. Soiling charge: As per the National Transport Authority’s guidelines, you will be charged €140 if after your journey the tow truck licensed vehicle interior requires cleaning. Damage: You will be charged at cost for any damage to the tow truck vehicle caused by you. 3.1 We may terminate these Terms and close any account you have with us by giving you 7 days’ notice in writing by email to your registered email address. We may also terminate these Terms and close your account without notice if you breach any of your obligations under these Terms, if bankruptcy proceedings are brought against you or if you do not pay a court judgment on time. 3.2 We reserve the right to suspend, restrict or terminate your access to TowNow at any time without notice if we have reasonable grounds to believe you have breached any of these Terms. This shall not limit our right to take any other action against you that we consider appropriate to defend our rights or those of any other person. 4.1 We accept liability for death or personal injury caused by our negligence or that of our employees and agents. We do not seek to exclude liability for fraudulent misrepresentation by us or our employees or agents. You have certain rights under the law. These include that we will provide TowNow to a reasonable standard and within a reasonable time. Nothing in these Terms is intended to affect these statutory rights. For more information about your statutory rights you can contact your local Citizens Advice Bureau or Trading Standards Office. 4.2 If we breach these Terms, We shall only be liable for losses which are a reasonably foreseeable consequence of such a breach, up to a maximum of €1,000. “Foreseeable” means that the losses could have been reasonably contemplated by you and us at the time of entering into these Terms. 4.3 We are not responsible for: (i) losses not caused by our breach; (ii) the actions or inactions of any drivers; (iii) the actions or inactions of other TowNow users; (iv) indirect losses which means loss to you which is a side effect of the main loss or damage and where you and us could not have reasonably anticipated that type of loss arising at the time of entering into these Terms; or (v) failure to provide TowNow or to meet any of our obligations under these Terms where such failure is due to events beyond our control (for example a network failure). 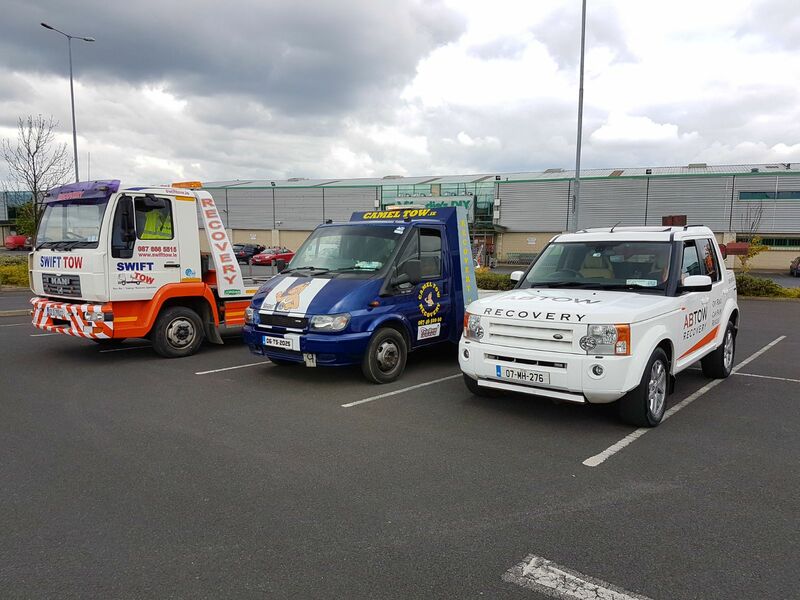 5.1 These terms and conditions apply to the promotion currently operating within tow truck vehicles using the TowNow driver application, whereby users are given and must access a unique URL, enter their mobile phone number and register as a credit card account customer in order to become eligible for €5 credit on their first tow with TowNow. 5.2 Only one €5 credit offer redemption is permitted per registered customer regarding this promotion. 5.3 This is an acquisition offer only and is not valid for existing customers at this time. 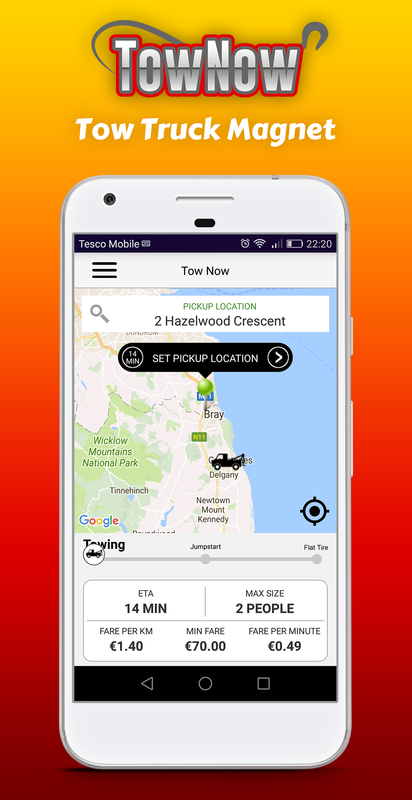 5.4 Customers must register a valid credit card within the TowNow app and book a tow truck on card account, in order to redeem their €5 credit. Cash fares will not have the €5 credit redeemed against them. 5.5 The €5 credit is valid for one ride only and will be subtracted from the total value of the fare of the customer’s next ride. 5.6 Minimum fare amount for this promotion is €70. 7.1 Please read our full Competition Rules page before entering into any TowNow competition. TowNow posts the details of all competitions on our news page where the closing date is specified. To enter any TowNow competition you must be: (a) Resident of Ireland; and (b) 18 years old or over at the time of entry. No purchases are necessary. Competitions are not open to employees (or members of their immediate families) of TowNow Network Ireland Ltd.
8.1 We may wish to transfer our rights or obligations or sub-contract our obligations under these Terms to another other legal entity. You agree that we may do so provided that this will not adversely affect the standard of service you receive under these Terms. As set out in clause 3.3, you may terminate your agreement with us at any time. These Terms are personal to you. You may not transfer your rights or obligations under these Terms to anyone else. 8.2 If you breach these Terms and we take no action against you, we will still be entitled to use our rights and remedies in any other situation where you breach these Terms. 8.3 If any part of these Terms is disallowed or found to be ineffective by any court or regulator, the other provisions shall continue to apply. 8.4 These Terms are not intended to give rights to anyone except you and us. 8.5 We are constantly looking for ways to improve and expand TowNow. We may amend these Terms from time to time in order to reflect changes to TowNow in which case we will give you reasonable notice [by email] of any changes to these Terms. You can terminate at any time as set out above. 8.6 We will do our best to resolve any disputes over these Terms. If you wish to take court proceedings against us you must do so within the Republic of Ireland. If you live in Ireland the laws of the Republic of Ireland will apply. 8.7 These terms and conditions were last updated on 12 April 2017. This document explains how TowNow App processes information about you which is personally identifiable (“Your Information”) when you use the TowNow App or website, whether you are a driver, passenger or simply a visitor. any other information provided by you pursuant to your use of TowNow. where you are a driver to provide you and other drivers with relevant reports including aggregate information based on other drivers’ operation and financial performance (although please note that this information will always be aggregate, anonymous, statistical information and will never identify you to any other driver). We never disclose driver reporting information to anyone (except pursuant to a court order or otherwise where required by law). to third parties from whom you have chosen to receive marketing information. You should take care when using any TowNow social networking features since the information you choose to make available can be seen by other users in the selected group. We do not monitor the use of such features in the normal course of business although we reserve the right to do so at our discretion. 2.1 How do we protect Your Information? All information you provide to us is stored on our secure servers. Where we have given you (or where you have chosen) a password which enables you to access certain parts of the Service, you are responsible for keeping this password confidential. We ask you not to share a password with anyone. Unfortunately, the transmission of information via the internet is not completely secure. Although we will do our best to protect Your Information, we cannot guarantee the security of data transmitted to the Service; any transmission is at your own risk. Once we have received Your Information, we will use strict procedures and security features to try to prevent unauthorised access. You have the right to request a copy of the information that we hold about you. If you would like a copy of some or all of such information, please contact us. We may make a small charge for this. You may ask us to correct or remove information you think is inaccurate by contacting us. We hope you will be happy with the way we handle your information but if not you have the right to complain to the Information Commissioner if there is a problem. We do use certain cookies as part of our TowNow services. The cookies used are session cookies for the purpose of enabling you to use the service (for example to enable you to complete a registration or access information). You can choose to disable cookies (through your browser settings) although you should be aware that this may prevent you from being able to use all parts of TowNow. For more information on cookies and how to disable them see the ICO guide. 1.1 You can only use TowNow if you are an insured tow truck driver. We will not let you join (in our discretion) where: (i) we have reason to believe that you are not a licensed truck driver; or (ii) you do not provide the required information and headshot for registration. 1.2.8 to compensate and defend us fully against any claims or legal proceedings brought against us by any other person as a result of your breach of these Terms. 1.3 In relation to the reporting information that we provide, we use all reasonable endeavours to ensure that such information is accurate but we can’t guarantee that it will always be accurate or correct and therefore you should use your own judgment when acting on the basis of information provided. 1.4 Please note that we are not responsible for the behaviour, actions or inactions of passengers whether or not they are TowNow users (although, where such passenger is a TowNow registered passenger and pays through TowNow, payment protection is provided in the circumstances set out in clause 2.3 below). Any contract for the provision of tow truck licensed vehicle services is between you and the user and not TowNow and we simply provide a platform to introduce drivers and passengers and facilitate payments in certain circumstances. 2.1 It is free to generally download and use the TowNow Driver app. 2.2. any fees due to you shall be paid by us less: (i) any chargebacks and chargeback costs (where card issuers, schemes or financial institutions refuse to settle a transaction or demand payment in respect of a disputed transaction and the administrative costs incurred as a result of this); and (ii) any fees or costs or expenses in connection with assessments which card schemes or other financial institutions require us or you to pay; and (iii) TowNow set-up administration costs as agreed; and (iv) TowNow agreed commission rates per job. 2.2.1. we have the right to suspend the processing of any transaction where we reasonably believe that the transaction may be fraudulent or involves any criminal activity or where we reasonably believe you to be in breach of these Terms. 2.3.2 any fees due to you shall be paid by us less: (i) any chargebacks and chargeback costs where a passenger disputes the services you provided; and (ii) any fees or costs or expenses in connection with assessments which card schemes or other financial institutions require us or you to pay. You agree to co-operate with and support us (including through the provision of relevant information) in the event of a dispute over any transaction. 2.4.2 pending investigation where a transaction is considered to be fraudulent or otherwise suspicious or where a transaction requires validation with a card issuer. 2.5 You acknowledge that payment providers may ask that we or they conduct an audit of your activities to ensure compliance with these Terms and use of TowNow App and you agree to co-operate fully with any such audit. You further agree that you will co-operate in relation to any financial crime screening that is required and to assist us in complying with any laws and card or financial institution rules or policies. 3.1 We may terminate these Terms and close any account you have with us by giving you 7 days’ notice in writing by email to your registered email address. We may also terminate these Terms and close your account without notice if you breach any of your obligations under these Terms, if you cease to be a licensed tow truck driver, if bankruptcy proceedings are brought against you or if you do not pay a court judgment on time. 3.3 You may cancel these Terms at any time by simply closing your account by following the instructions on the app or website. 4.3 We are not responsible for: (i) losses not caused by our breach; (ii) the actions or inactions of any passengers (other than in the circumstances set out in clause 2.2); (iii) the actions or inactions of other drivers; (iv) indirect losses which means loss to you which is a side effect of the main loss or damage and where you and us could not have reasonably anticipated that type of loss arising at the time of entering into these Terms; or (v) failure to provide TowNow or to meet any of our obligations under these Terms where such failure is due to events beyond our control (for example a network failure). 5.1 We may wish to transfer our rights or obligations or sub-contract our obligations under these Terms to another legal entity. You agree that we may do so provided that this will not adversely affect the standard of service you receive under these Terms. As set out in clause 3.3, you may terminate your agreement with us at any time. These Terms are personal to you. You may not transfer your rights or obligations under these Terms to anyone else. 5.5 We are constantly looking for ways to improve and expand TowNow. We may amend these Terms from time to time in order to reflect changes to TowNow in which case we will give you reasonable notice by email of any changes to these Terms. You can terminate at any time as set out above. 5.6 We will do our best to resolve any disputes over these Terms. If you wish to take court proceedings against us you must do so within the Republic of Ireland.